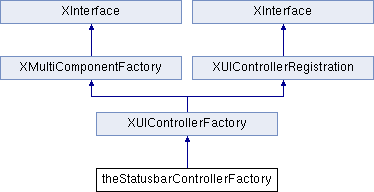 specifies a factory that creates instances of registered status bar controller. A status bar controller can be registered for a command URL and a model service name. A status bar will automatically create a status bar controller if it contains a registered command URL. Prior to LibreOffice 4.3, this singleton was only available as a (single-instance) StatusbarControllerFactory service.